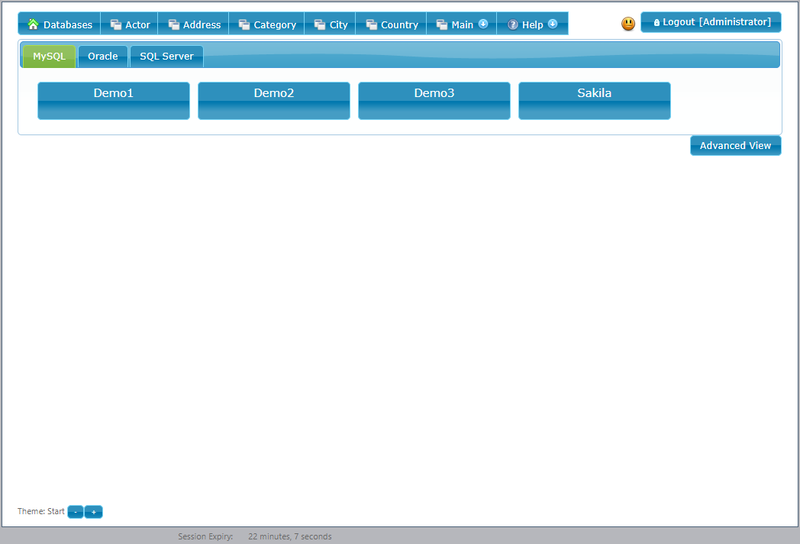 The database preferences is where you setup the initial and main properties for the database. You can view the first part of the video Adventure Works in 5 Minutes to see a walkthough of the Database Preferences. To access the Database Preferences you would click on the gear next to the database name in the advanced Database view. The main preferences cover a number of areas from the main caption to the security. Caption: The Display name of the database as seen in the User and Advanced menu. Description: Room for a short description to give a user more context. Group: The Group name under which to place this database. The group name is explained in more detail in the Creating Database Groups section below. Date Format: Set the default format for any displayed dates. Label Position: The default position of field labels. Hidden: Primarily used to hide System Databases to which a user might have access as part of a connection. Theme: Select a specific UI theme for a database. If a theme is selected then a user will not be able to pick a different one. Custom CSS File: Allows you to specify a custom CSS file that is loaded when this database is in view. Various elements including Tables, Layout Groups, Fields, etc.. can have a custom CSS class name assigned so that it becomes easier to make custom layout changes. In the Advanced database view show at the top of this page the databases are organized by connection and server which makes sense for administrators. 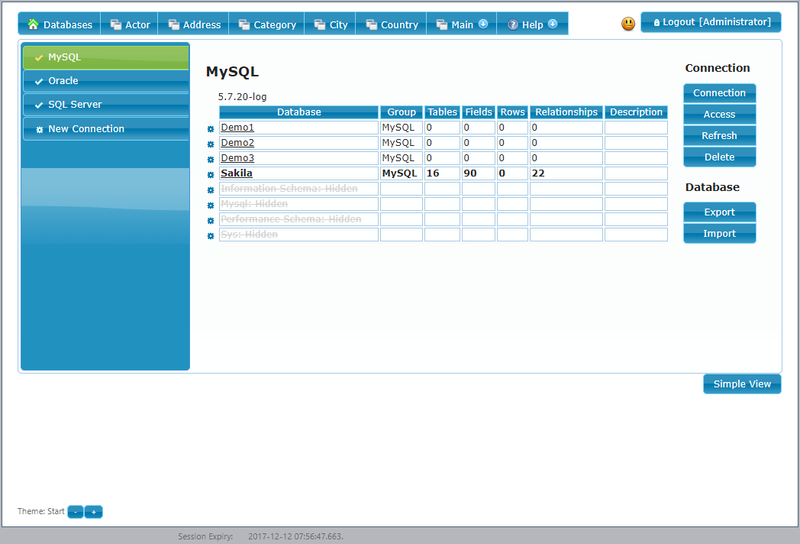 In th User database view shown to the right the databases are organized into tabs based on the group that is assigned on the main tab of the Database Preferences screen. This allows the various databases to be organized into groups that the business understands such as by department or function. 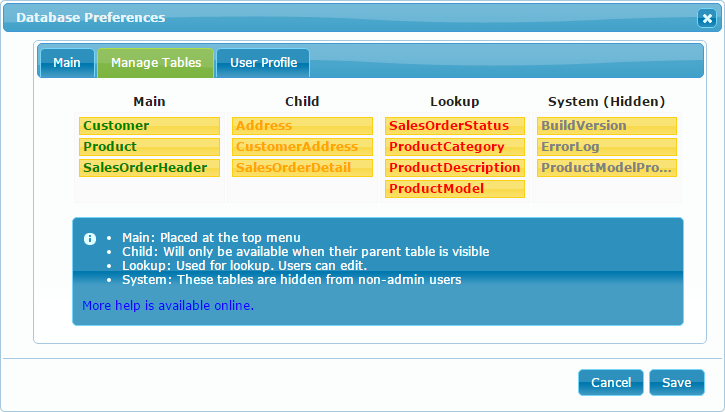 The Manage Tables tab is where you do the initial setup of how your tables will appear to the user. There are four columns in the Manage Tables tab which correspond to the four different ways that dbFront understands tables. The main tables represent the primary entry points for a database. If there are only a few main tables then they will all appear individually in the menu at the top of the screen. If there are too many then the first number will appear in the top menu and the complete set will appear grouped in a menu named "Main". Tables that are designated as child tables won't be accessible from any menu directly but they will appear in an appropriate tab when their parent tables are loaded up. The tab label will include the name of the field in the tab label so that it is clear how the child table is related. When the child table is shown, the field(s) which are part of the relationship to the parent won't appear on the child tab. By definition these fields will have the exact same values as the parent table, and so showing these values would be a waste of screen space. Tables that are marked as lookup tables won't be included in the normal flow of the application except when they are needed as a lookup source. Users will still have the ability to open these tables from the "Lookup" menu. The System tables collection covers all other tables. Tables in this group won't be accessible to any user except for when they are used as a lookup source and even then, the users can only see what is made available in the dropdown field. Administrators will still have full access to these tables via a menu named "System"
As part of the security features in dbFront, you can use the requirement for a Database Profile to restrict or manage user access to individual databases. For more details see: User Profiles.